The Happy Girl Blog: Happy Monday from Puerto Rico! Happy Monday from Puerto Rico! Oh dolls, I am in heaven! The sparkling Caribbean ocean, soft sandy beaches, coconut trees swaying in the warm wind, the best pina colada I've ever tasted, authentic dishes to savor, kind people with lots to say, and my amazing hubby experiencing everything with me. Basically, Puerto Rico is amazing, and I've been here less than 24 hours. 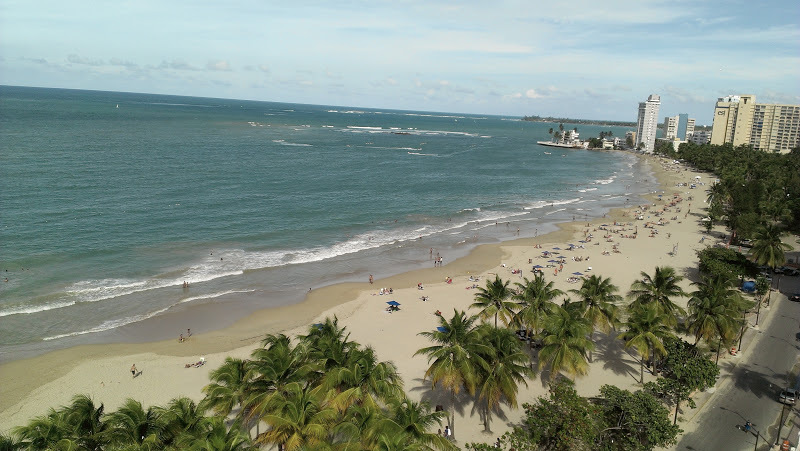 Our hotel, the San Juan Water & Beach Club, is great! It's a smaller boutique hotel that is literally right on the beach. With a name like it has, you can believe it is water themed, with fountains trickling water and blue, white and aqua colored everything. The elevators even have a water fall behind the back glass walls with blue led lights making it shimmer, quite the experience even if they are hot and muggy inside. Our room is white and light blue, on the smaller side, with a giant king size bed that was delightful to sleep in last night. We have partial ocean view which is great, and the whole staff have been friendly and accommodating. Traveling here was long and exhausting, so I went to bed at 8pm last night, and woke rested and ready to take on the island life before 7am. To not bother Billy with my restless self, I went for a run on the beach and managed to get in 2.8 miles on our beach during high tide, which was plenty with temperatures around 80° and high humidity. I showered, then grabbed breakfast and brought some back for my sleeping Billy and it wasn't even 9am! Since we have lazed around, and now have plans to see Billy's family who live in San Juan. I'm sure I'll have lots more to say and tons of pictures to post when we get home, but I wanted to stop in and say hello and wish you all a happy week! Sounds so amazing! Enjoy enjoy enjoy!!! I have however been following your pictures on Instagram and it looks amazing! !